Soup is a warming, comforting dish that can be eaten for any meal. It also makes a great snack if you're flagging during the afternoon and need a bit of a boost. You can make soup from virtually any ingredients and that's the real beauty of it. It's a very economical way of making the most of ingredients and leftovers and, if you make a big batch, you can freeze it, or keep it in a covered container in the fridge and you've got lunch ready to go for the next few days. There are many great ideas for really quick and easy soups and most of them can be adapted to suit the ingredients that you happen to have in your cupboards. Bland flavours can be spiced up with a few extra ingredients and those odd veggies in the bottom of fridge, that wouldn't be sufficient for a meal, can all be bundled into the pot to create a delicious soup. Soup is also a good way of cramming some much needed vegetable portions into your diet, so it can be a very healthy meal. Team a bowl of steaming soup with some crusty granary bread and you'll have a really tasty, filling meal that's full of the feel-good factor. Try some of these quick recipes for favourite soups and then adapt as you see fit. They all serve four people. This is a real classic and it's a great winter warmer. Better still, it's cheap and easy to make. Heat the olive oil in a large saucepan, add the onion and cook until softened. Add the leeks to the pan and cook over a low heat, stirring, for about 5 minutes. Add the stock and potatoes to the pan, stir and bring to a simmer. Cook for about 15 minutes, until the potatoes are soft and cooked through. 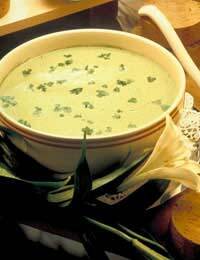 Season well to taste and transfer the soup to a blender. Blend until smooth. Reheat gently before serving, adding the cream and extra seasoning, if necessary. Heat the butter in a large saucepan, add the onion and cook until softened. Add the stock and vegetables to the pan and bring to a simmer. Cook for about 20 minutes, until the vegetables are very tender. Season well with salt and pepper and transfer to a blender. Blend until smooth. Reheat gently and serve with a dollop of crème fraîche in the centre of each bowl. Cook the pasta in boiling water, according to pack instructions. Drain well and set aside. Heat the oil in a large saucepan, add the celery and garlic and cook gently for about 5 minutes, until softened. Add the vegetable stock and cannelloni beans, stir well then add the tomatoes. Cook for about 10 minutes. Add the cooked pasta to the pan. If the soup is very thick, add some more vegetable stock or boiling water. Season well with salt and pepper and cook, stirring, for a further 5 minutes. Hopefully these ideas will inspire you to cook soup and experiment with your own ideas. There are so many wonderful recipes and you'll never get bored of tucking into a delicious, hot bowl of homemade soup.